Our winter visitors, the Humpback Whales, are back in Hawaii. It's that magical time of year when the whales swim 2,000+ miles from the chilly, food rich waters of Alaska to enjoy the warm Aloha of Hawaii for mating and calving. Whale season runs from November through April. It's peak season right now. The guides call it whale soup or whale popcorn, because they are everywhere. And it's awesome. Getting a good picture of a whale is a combination of good luck and clicking at the right time. I suppose a lightening fast shutter or burst mode doesn't hurt either. I went on two different trips this past week. I would highly recommend them both. First, was the Discover Molokini snorkel trip from Trilogy Excursions. You start the day with coffee and cinnamon rolls, cruise to Molokini, snorkel, eat lunch, bask in the sun, and sail back with mai tais. This time of year, there is the added bonus of, you guessed it, whales. I didn't take an underwater camera to Molokini, just wanting to soak in the moment, so you'll just have to imagine brightly colored fishes of all shapes and colors. I'll have a mai tai. Maybe two. I also went on a Whale Photo Safari with the Pacific Whale Foundation. This is a small group raft trip with serious photographers in mind. My camera was probably the smallest on board. I saw some of the pictures from the staff photographer on board - absolutely amazing. You could see the baleen in the whale's mouth. Boats can only approach whales up to a certain distance, but if the whale chooses to swim closer, or, ahem, come right up behind the raft, that's just fine. We lucked out with amazing whale action all morning including mother and baby whales and crazy competition pod action. Competition pods are groups of bachelors vying for the attention of a lovely lady whale. There's a lot of breaching, fighting and fin slapping. Must be how those bachelors show their worth. This makes three whale excursions so far this season, and I will probably go again. It never gets old. 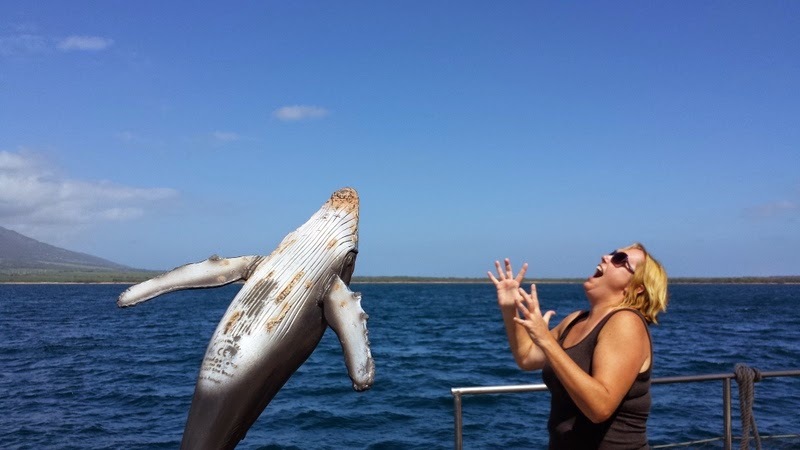 Have you been on a whale watch? Where did you go? Where's your favorite place to see animals in their natural habitat? Happy February to you. If you're a new year's resolution kind of person, I hope you made it through January with flying colors. If you avoided the gym for the month of January because you didn't want to fight with all those resolutionists, I hope your favorite treadmill and elliptical are waiting for you this month. Yesterday I celebrated our Maui winter visitors, the Humpback whales. Ok. That picture isn't of a whale. 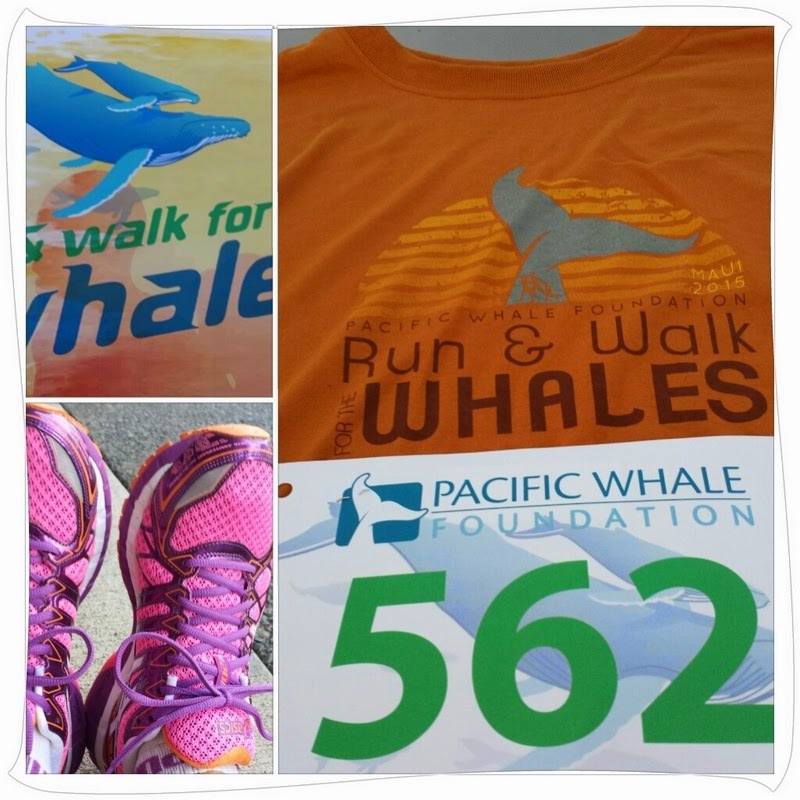 Yesterday was the Pacific Whale Foundation Run & Walk for the Whales. If I'm going to run (or walk quickly) for something, whales are a good a reason. The run is a part of the 35th annual Whale Festival. Here's how I'm celebrating whales for three weekends in a row. That's a lot of celebrating. After running slower than a whale can swim, I decided I would go to the end of south Maui for no other reason than I haven't been there yet. I've been to the top of Maui, Haleakala. I've driven the entire west coast. I've driven the road to Hana. In 15 months time, almost to the day, I had not driven to the end of the road in Makena. The farthest I'd been was to the beach by the Makena Beach and Golf Resort. 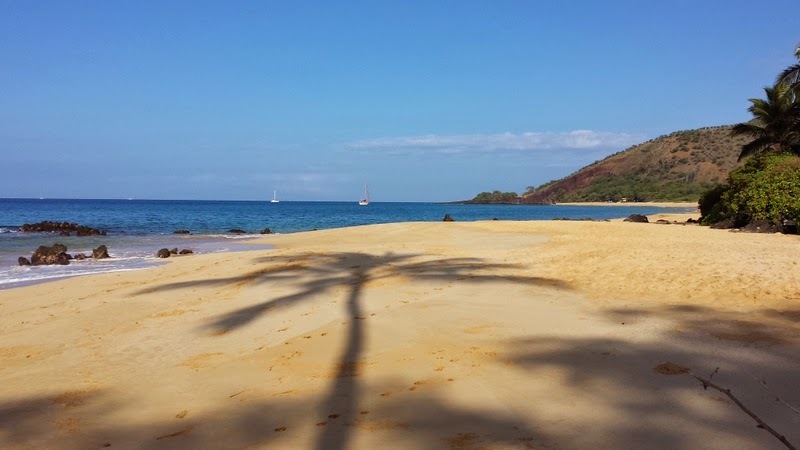 There are two parking lots for Big Beach at Makena State Park. I parked at the second one. There were other cars in the lot, but as you can see from this picture, it's called Big Beach for a reason. Plenty of room for everyone without tripping over anyone. I forgot to bring my snorkel gear. Next time I won't make that mistake. People were all up in the water seeing cool things. 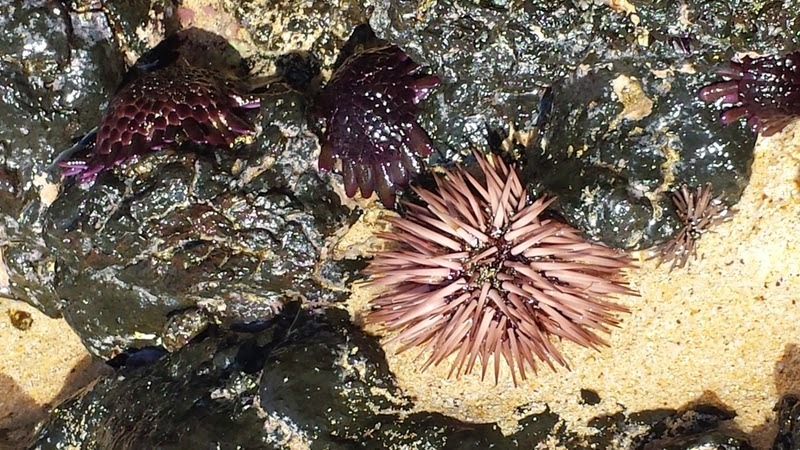 Even from shore, I saw some sea life. 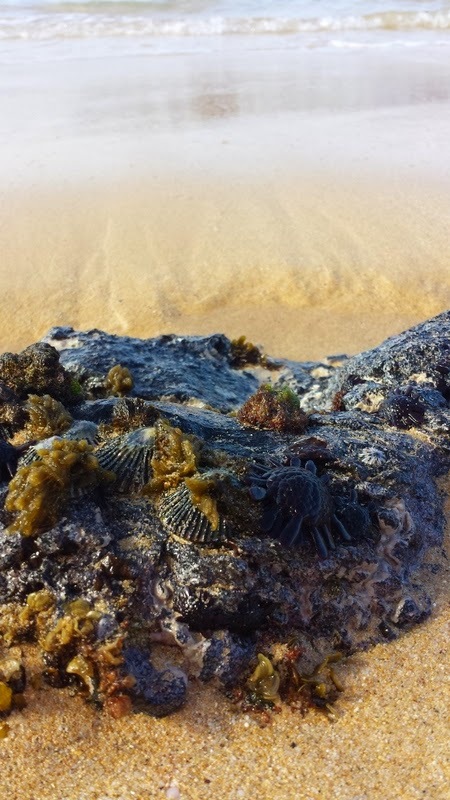 If you keep driving on Makena Alanui Drive, the road will narrow, you might see some fresh coconut stands on the side of the road, and then you'll enter the Ahihi-Kina'u Natural Area Reserve. Keep going. 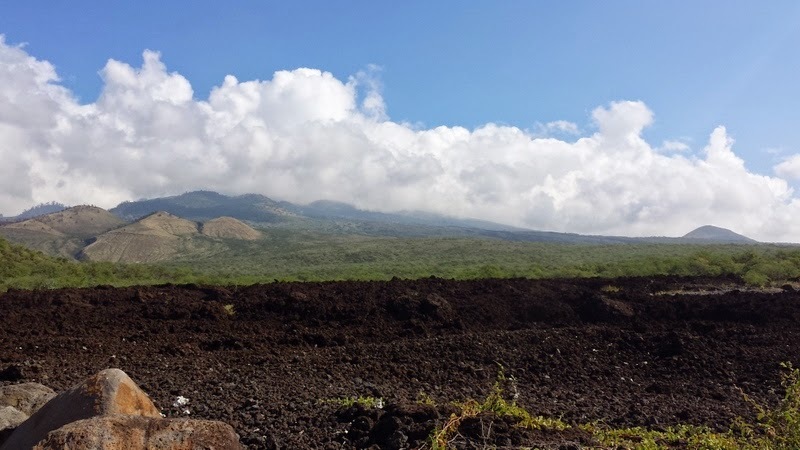 You'll pass a two mile stretch of lava rock where no stopping or parking is allowed, though there was definitely some stopping going on as the landscape is so dramatic that a quick photo out the car window seemed to be the trend. Again, I was sad that I didn't have my snorkel set. 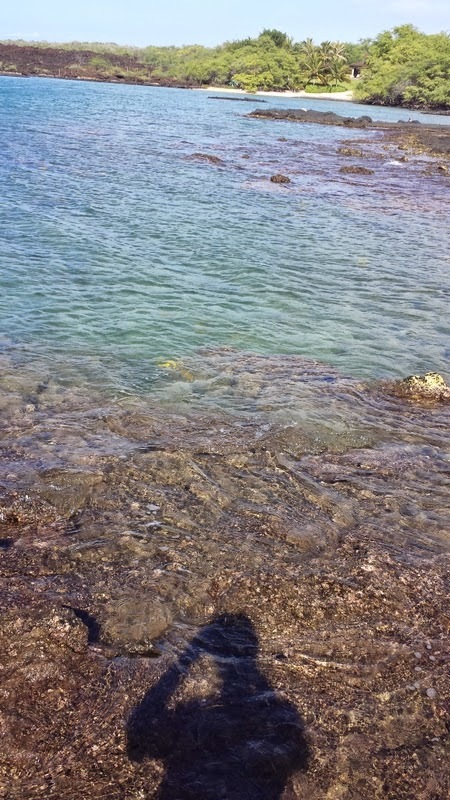 The water is so clear that I could see the bright yellow fish swimming at the edge of the reef from my place standing on the lava rocks. If you look back towards the mountains, it's all lava rock. Colorado is 104,185 square miles. In contrast, Maui is 727 square miles. I feel like I've seen quite a bit of Maui so far, but I keep finding new places to visit and explore. Football is not really my thing, so I probably won't be watching the game this afternoon. I've already watched the cuteness that is the Budweiser puppy commercial. Whatever you do, have fun!